Josh, Co-Owner of Real Help Custom Concrete, who specializes in concrete design, was called to this homeowners house to discuss their existing blacktop driveway and expressed their interest in a new concrete driveway. The homeowner was looking for a decorative finish to the concrete, but was also looking to be cost effective to stay on budget. Having experience with all types of driveway finishes, Josh, working with the homeowner, came up with the design of dark colored broom finished borders to accent the lighter colored checkerboard broom finished driveway. This driveway consisted of about 45 yards of colored concrete and took roughly a day and a half to complete. The border color is Solomon Leather and the driveway color is Solomon Trail Dust which complements the brick color of the house. A special technique is used to achieve the checkerboard appearance on the surface of the concrete and can be seen driving down the street. 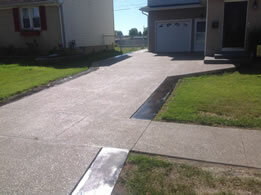 The Real Help Team is glad to have worked with this customer to give them the driveway they’ve been wanting for years! 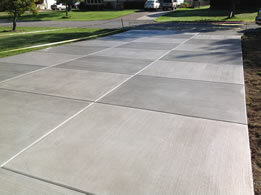 Concrete, when installed by professionals, using the correct materials, will outlast any other material that is commonly used for driveway construction. Besides the unmatched strength and durability of a concrete driveway, the versatility and aesthetics of concrete also outweigh any other material choice. With the inclusion of Wire Mesh for structural support, Fiber Mesh for aesthetic soundness and pouring your driveway at 4500 PSI, your concrete driveway is given the best chance to stand the test of time and traffic it will endure for years to come. 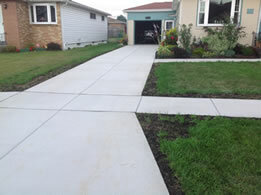 Appearance – The addition of a concrete driveway, whether it be broom finished, colored, pattern stamped, or exposed finish, will dramatically change the appearance of not only your front yard, but your entire property. Most homeowners find the various finishes for concrete to me more attractive than the dark appearance of asphalt and the maintenance associated with pavers. Structure – Unlike asphalt, concrete is solid, hard and strong and will retain those qualities during weather extremes. Asphalt can sometimes soften during hot summer days causing it to become pliable and allows for potential damage from vehicles. Concrete, unlike pavers, is one solid structure and shifts together, allowing for the surface to stay intact, versus pavers which move individually causing the homeowner to complete maintenance annually to keep surface level. 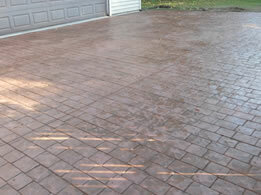 Maintenance – Maintenance for a concrete driveway is minimal when compared to other paving materials. With the constant resealing and patchwork necessary for asphalt, and the upkeep of having pavers with annual weeding and resetting of individual pavers, a concrete driveway is your money and time saver! Concrete finishers have been broom finishing concrete for about as long as there has been concrete. Broom finished concrete is the industry standard for exterior surfaces allowing for slip resistance and traction for walking. The checkerboard broom finish is a new technique that is becoming more popular with residential driveways to increase the aesthetic appeal without significantly increasing the price of the project. The checkerboard broom finish allows for the same slip resistance and traction as broom finished driveways, but shows different shades of the concrete to mimic a checkerboard when exposed to sunlight.